This watchband is simple, durable and comfortable to wear. Fashion and casual watchband meets your style. 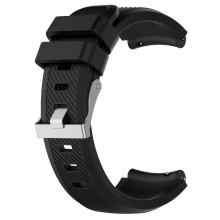 An ideal replacement for Amazfit 2 / 2S watch (22mm band). Made of silicon material, environmental and healthy. Soft, fashion and durable, comfortable to wear. Contracted design style, perfect for many occasions. The watch is not included. The watchband is suitable for Amazfit 2 / 2S, please check your watch model before buy it.